Born Nenno, Wisconsin, September 4; married; 2 stepchildren; 4 grandchildren. Graduate Hartford Union High School; A.D., University of Wisconsin-Washington County; B.S. in Radio-TV-Film, University of Wisconsin-Oshkosh. Member: St. Peter Catholic Church; Washington County Republican Party; Slinger Advancement Association; Washington County Agricultural & Industrial Society; Slinger Housing Authority; Village of Slinger Board of Trustees (2009—present). Former Chair: Eastern Wisconsin Counties Railroad Consortium; Washington County Aging & Disability Resource Board; Washington County Board of Health; Washington-Ozaukee County Joint Board of Health; Washington County Board (2016—18). 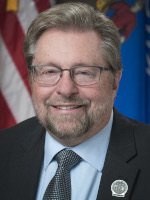 Former member: Waukesha-Ozaukee-Washington Workforce Development Board of Directors; Wisconsin Counties Association Board of Directors; Wisconsin Counties Utilities Tax Association Board of Directors; Washington County Board of Supervisors, 2006—18. Elected to Assembly in January 2018 special election. Reelected November 2018.